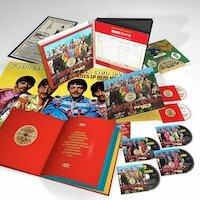 The Beatles will release a suite of lavishly presented Sgt. Pepper Anniversary Edition packages on May 26. The album is newly mixed by Giles Martin and Sam Okell in stereo and 5.1 surround audio and expanded with early takes from the studio sessions, including no fewer than 34 previously unreleased recordings. A 144-page book includes new introductions by Paul McCartney and Giles Martin, and chapters covering comprehensive song-by-song details and recording information, the design of the cover, the album's musical innovations and its historical context by Beatles historian, author and radio producer Kevin Howlett; composer and musicologist Howard Goodall; music producer and writer Joe Boyd; and journalists Ed Vulliamy and Jeff Slate, illustrated with rare photographs, reproductions of handwritten lyrics, Abbey Road Studios documentation, and original Sgt. Pepper print ads.